Understand that strategy is a continuous cycle. You don't have all the information you need, you don't know all the patterns and there are many aspects of life that are uncertain ... fortunately not all is. Start with a direction (i.e. a why of purpose, as in "I wish to win this game of chess") but be prepared to adapt as the game unfolds (i.e. 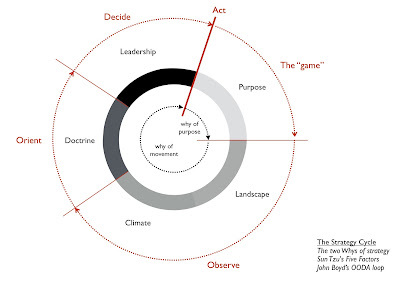 the why of movement, as in "should I move this chess piece or that one?"). Your first step on the journey is to understand this strategy cycle. 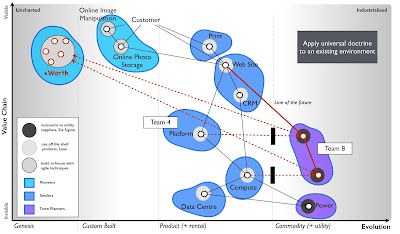 In business, extremely few companies have maps. Most have things they call maps (e.g. 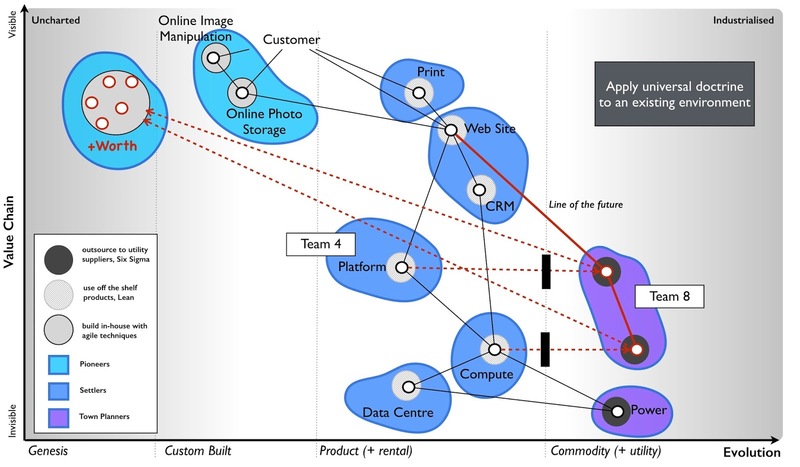 stories, business process diagrams, strategy plans) which turn out not to be maps as they lack the basic characteristics. 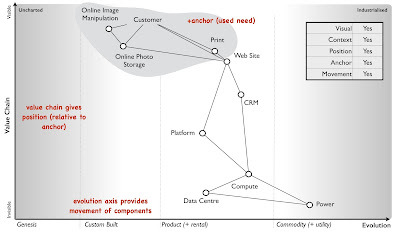 A simple way of mapping a business is to start with user need, understand the value chain and map it over evolution. 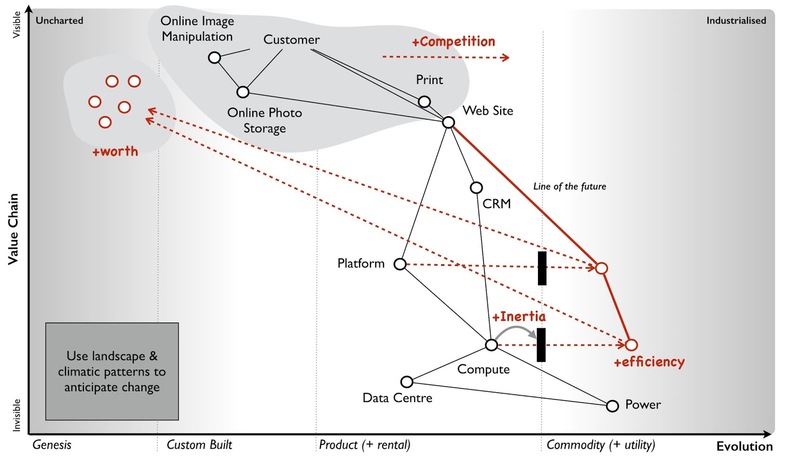 Once you have a map, then you can start to learn the next part of the strategy cycle i.e. climatic patterns. These are things that effect all players and can be considered rules of the games. The more you play, the more rules you'll discover. I've added a basic list, to get you started in business. 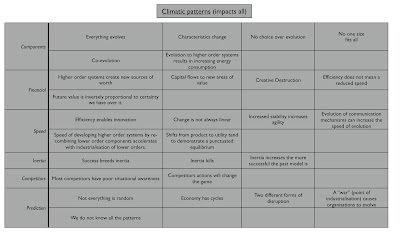 Even with a few basic patterns you can apply these to your map to start to learn how things could change. There will be more patterns out there but again, you'll need to keep playing the game to learn them. With a map, you visibly communicate in a common language those things you expect to change. This also enables others to challenge your assumptions, a key part of learning. Now you have an idea of your landscape and how it can change, you'll want to start doing stuff about it. However, there are two classes of choices - universal and context specific. 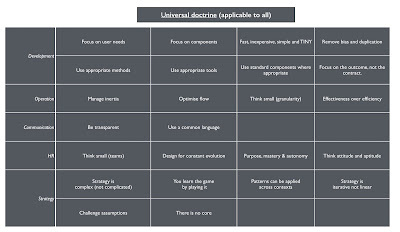 Universal choices are those which are beneficial to all, regardless of the context. To help you on your way I've provided a basic set which we call 'doctrine'. 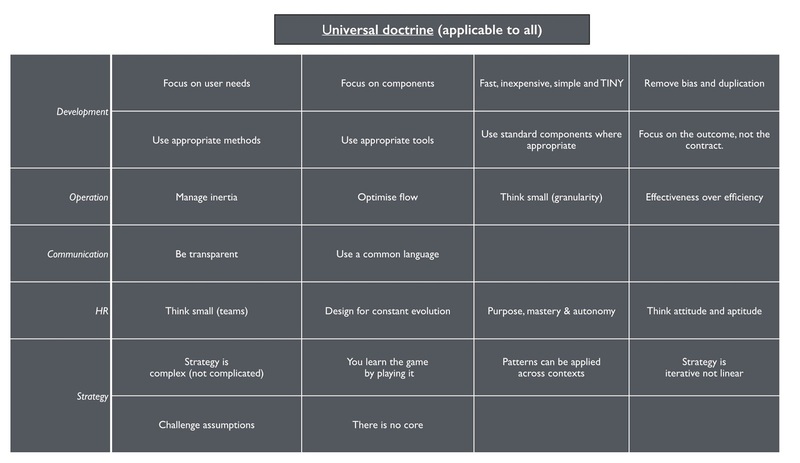 As with patterns, the more you play the game then the more universal forms of doctrine you'll discover. The other class of choice is context specific. You will learn there exists many approaches that you can deploy in order to influence the map. These approaches depend upon the map and the position of pieces within it i.e. they are not universal and you have to learn when to use them. I've provided a basic list. 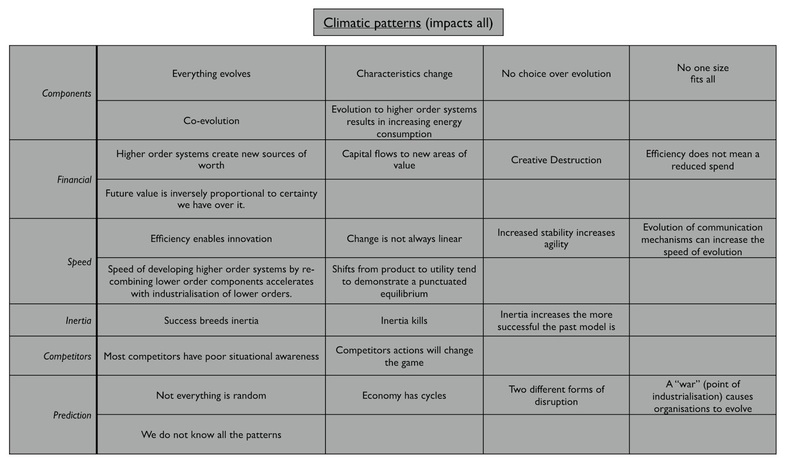 As with climatic patterns and doctrine, then the more you play the game then the more context specific patterns you will discover. 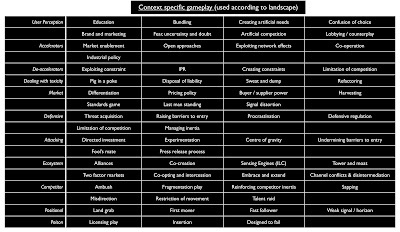 With your understanding of the landscape, an ability to anticipate change based upon climatic patterns and a knowledge of context specific play then you can manipulate the map. You use the map to determine where you could to attack and then use gameplay (e.g. an open source approach) to determine why you should attack this or that point over another. You then decide to act. You loop around the cycle and repeat this whole exercise. 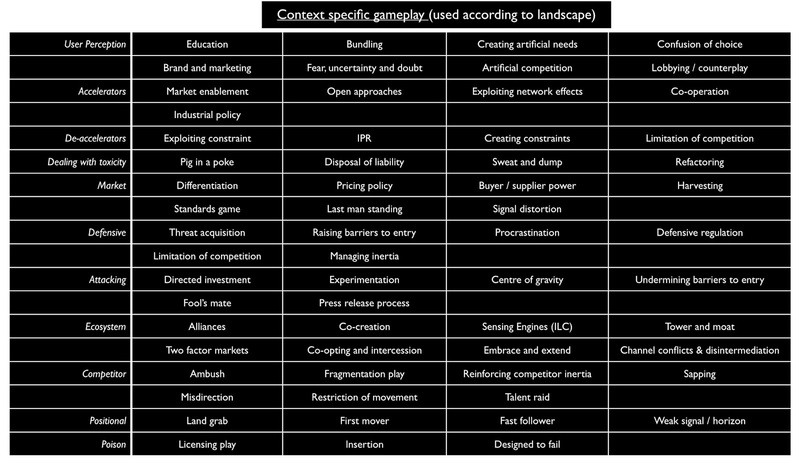 As you go, you will learn more about the environment, patterns, doctrine and gameplay becoming better at the game. 1. When companies tell you they have maps, they don't except in the rarest of cases. 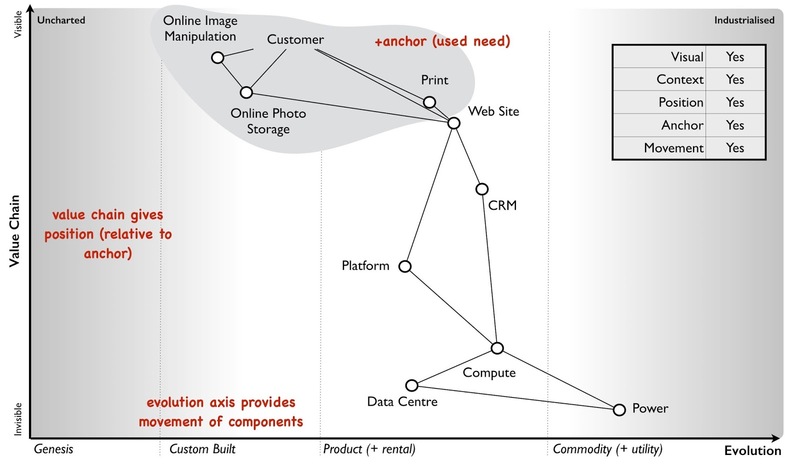 Most companies rely on things which are not maps (e.g. 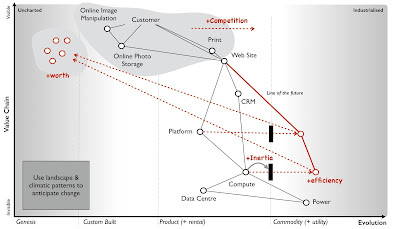 stories, customer journeys, business process diagrams, value stream maps) and fail to learn about the landscape. They will often use different forms of diagrams to communicate between groups causing endless miscommunication, alignment and duplication issues. The maps above have been used from nation states to individual systems and everything in between (they are also all creative commons, share alike). 2. The map is constantly changing. These are living documents. 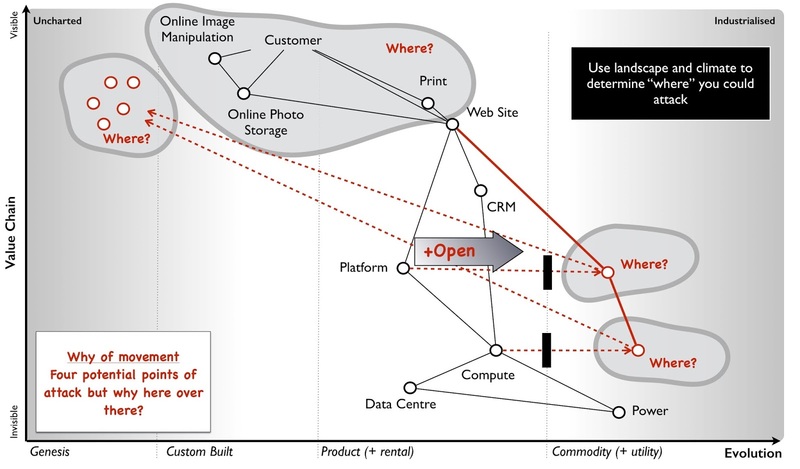 With practice it should take a few hours to map a business from scratch and these have to adapt as you discover more. This is relatively simple if they become embedded as a means of communication. 3. Most companies aren't playing chess when it comes to strategy (despite what you read). At best, most are simply meme copying others or running on gut feel and highest paid person's opinion. 4. Maps are a means of learning about the environment and communicating this. It's an iterative process and it will take you years to become good at it. In fact, I've been using these maps for over a decade and I'm still learning. 5. All models are wrong, some are merely useful. 6. Without a means of mapping the landscape (i.e. the terrain) then you can never effectively learn the terrain. Do note, when someone says the map is not the terrain, that's all well and dandy except that most companies do not have any form of map but are often reduced to telling stories (a bit like how Viking's navigated). 7. The components in the maps above represents points of capital. In the ones I've shown, I've mapped activities however you can map activities, practices, data, knowledge and other forms of capital. 8. "How to master strategy" ... well, I'm still learning. I'm sure someone will produce a better map at some point however for now, all I can say is that strategy seems to be a journey of constant learning. If anyone does actually become a master then I'd be pleased to read about how they did it.